The NIST Mass Spectral Library is the world's most widely used and trusted resource for identifying mass spectra. The NIST 17 EI Library has 306,623 spectra for 267,376 compounds and over 404K literature and experimentally determined GC Methods and Retention Indexes for 99,400 compounds, 72,361 of which have EI mass spectra in the library. NIST now records the RI values of all measured spectra, including the GC/MS Method with the spectrum when it is added to the user library. NIST 17 includes the standalone Mass Spectral Search Program, v.2.3, and the powerful AMDIS mass spectral deconvolution software. 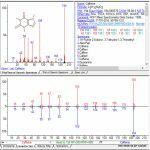 The Mass Spectral Search Program, v.2.3, interfaces to several different mass spectrometer manufacturer's data analysis software and is compatible with third party mass spectral libraries such as Designer Drugs 2018 and the Robert Adams Flavor and Fragrance libraries. 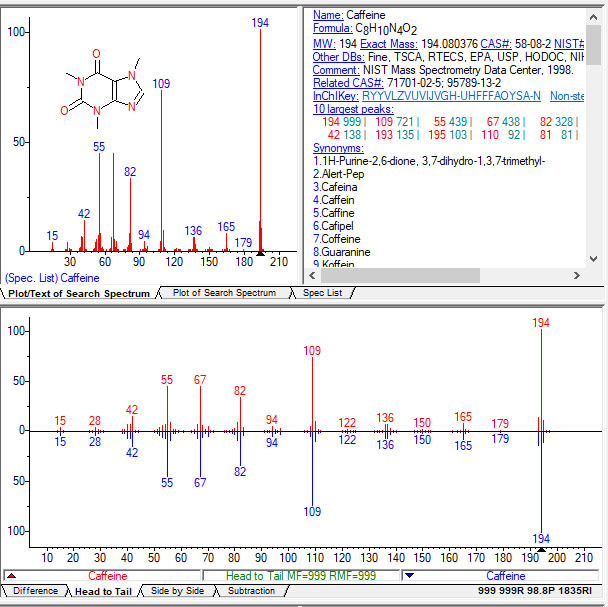 Main EI MS Library: Spectra for 267,376 chemical compounds. Replicate EI MS Library: 39,246 replicate spectra. Tandem (MS/MS) Library – small molecules: 574,826 spectra of 118,082 precursor ions from 13,808 chemical compounds. Tandem (MS/MS) Library – biologically-active peptides: 2 90,244 spectra of 6,803 precursor ions from 1,904 peptides. Retention Index Library: 404,045 RI values for 99,400 compounds; 72,361 compounds in the Main Library have retention index data. NIST MS-Search 2.3: The standalone NIST Mass Spectral Search Program. AMDIS 2.73: The Automated Mass Spectral Identification and Deconvolution System. Mass Spec Interpreter: A tool that allows an associated structure and spectrum to be evaluated with respect to fragmentation. Can me used with molecular or adduct ions (like MH+) with integer or accurate mass. Mass Spectrum Interpreter: This is a utility developed and used in the NIST Mass Spectrometry Data Center to assist in the evaluation of mass spectra. It finds possible structural origins of peaks in a mass spectrum and provides formula and isotopic processing utilities. It can operate in conjunction with the NIST MS Search Program or standalone. NIST 17 and MS Search are NOT compatible with Windows 3.x, 95, 98, Me, NT 3.x, Windows NT 4.0, Windows 2000, and Windows XP before SP3. * Issues with the custom scaling level feature of Windows 10 may have been observed. It is best to turn the custom scaling level feature in Windows 10 off. Use of any NIST Mass Spectral Database is limited to a single computer by a single user at any one time. There is no restriction as to multiple copies in the same or multiple formats on the same single user computer or to backup copies which are for management purposes and not for use on any other computer. In the event of an upgrade from a previous version of any Database, that previous version of the Database may not be installed on another computer and used in the same time period as the upgrade. The previous version may continue to be used on the same single-user computer on which the upgrade is installed. Diablo Analytical is an authorized distributor if the NIST Mass Spectral Library. You can purchase the Standard version of NIST 17, or the Standard version that includes the NIST 17 EI Library in the Agilent format (NIST17.L) for the Agilent Technologies MSD ChemStation and MassHunter data systems. Contact us about the availability of the NIST 17 EI Library in other formats. The software is shipped to you on a USB flash drive for compatibility with newer computers that lack a CD/DVD drive. The ship kit also includes the printed NIST 17 reference manual. Upgrades: Contact Diablo Analytical if you would like to purchase an upgrade from an earlier version of the NIST Library to NIST 17.